I was dancing and cyphering last night at a club, having a great time, but also dealing with some of the typical bull$%^& you encounter when you are in a crowded nightclub. 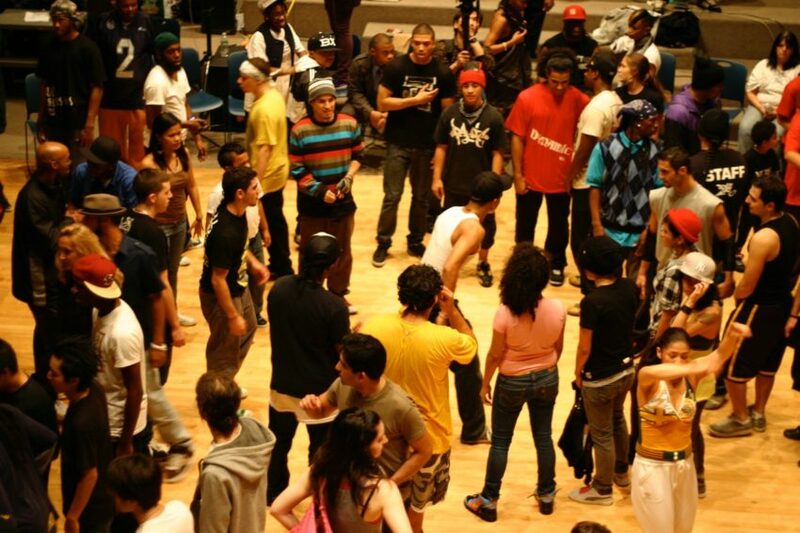 For those that don’t know, a cypher is a dance jam that comes from urban dance culture, where the dancers form a ring and one person goes into the middle to show off their moves. Yesterday I witnessed several instances where someone had to intervene before the cypher got ruined by an observer. A dance cypher is actually a pretty delicate thing. All it takes is one clueless, belligerent, or drunk person to wreck it. But even well intentioned people can hurt the dynamic of the circle. 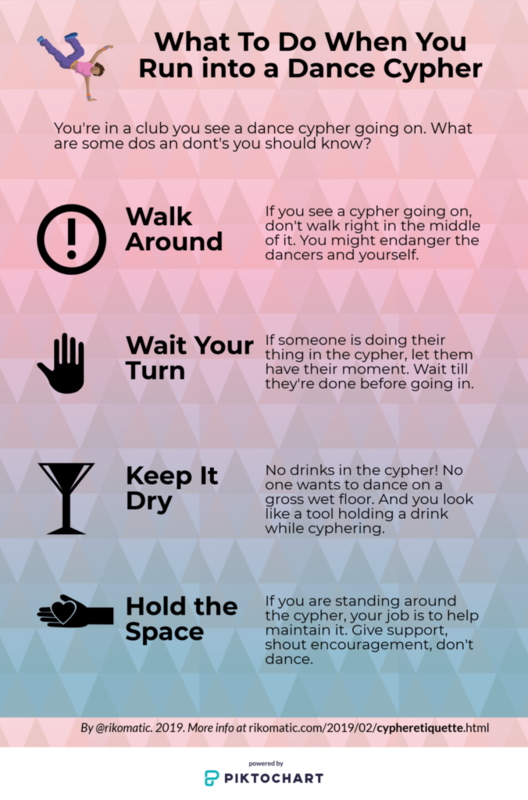 Here are four things a bystander should remember when they encounter a dance cypher. First here’s the infographic version, with a more detailed discussion below. If you see a cypher going on, don’t walk right in the middle of it. Often in a crowded club, I encounter people trying to get from one side of the dance floor to another, and they see an open space and make a beeline for it, not realizing it’s a cypher. It’s pretty dangerous for both the dancer in the circle and the person walking through, particularly if the dancer is b-boying. I’ve seen people get kicked in the face by a windmill. It’s not pretty. If someone is doing their thing in the cypher, let them have their moment. Sometimes enthusiastic observers see someone dancing in the cypher and they want to dance with that person. Don’t. It takes away from what that person is creating, and it’s distracting for everybody. If you have something to share, wait for that person to finish and then go in. No drinks in the cypher. No one wants to dance on a gross wet floor! It’s actually pretty dangerous to have a floor that is wet and slippery. And you look like a tool holding a drink while cyphering. If you need to hold a beer to feel good about your dancing, the cypher isn’t the place for you. If you are standing around the cypher, your job is to help maintain it. Give support, shout encouragement. Grooving to the music is fine, but don’t dance full out if you are not in the center. That takes away from what the person in the center is doing, and it makes it less clear to others that a cypher is going on. See “Wait Your Turn” above. My dance friends have lots of other things that they want observers to avoid doing (don’t use a flash if you are filming; don’t push someone else into the cypher before they are ready). But I think these four are essential to not wrecking the cypher as an observer. I’m not an expert. I’m just a dancer trying to support the scene and the culture. What do you do to help keep the cypher safe and positive for everyone?